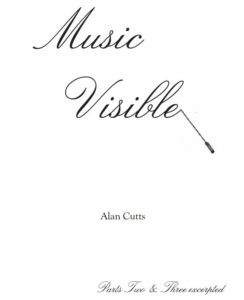 ‘Music Visible’ is the title Alan Cutts gave to a three-part course book he wrote for use with his students studying conducting as part of their degree course at CIT Cork School of Music. It was never meant for publication but as a conducting tutor it is unique in its combination of practical guidance and heart-felt inspiration for all those engaged in this most complex and vital aspect of music-making. The well-thumbed paper copies still treasured by Alan’s former students testify to its lasting value. It has therefore been decided to make it available online for any and every would-be conductor. Download Music Visible, Book 1 and Music Visible, Books 2 & 3, by Alan Cutts. Born in 1950, Alan grew up in London, becoming familiar with the standard orchestral repertoire, but developing a particular attraction to the post-war avant-garde. It was Joseph Weingarten whose endlessly painstaking teaching at the piano brought him to a fuller understanding of the 19th century piano repertoire. George Hurst’s summer conducting classes were an ongoing source of inspiration, while two hours with a pupil of Bela Katona set him up for years of reward later on teaching beginner and grade violin. Alan came to work in Ireland in 1979 with Wexford Festival Opera and the following year, established the Wexford School of Music with Eileen Herlihy to develop music education in the county. It was during this time that Alan began a long period of creating arrangements and teaching materials which are still widely used today. Performances were as director of the Wexford Festival Singers, the Wexford Youth Choir and the Wexford Youth Orchestra. Alan continued in Wexford before coming to Cork in 1997 to work with CIT Cork School of Music, taking choirs and string orchestras, and teaching conducting and orchestration on the degree and post graduate courses. His former pupils all speak so highly of Alan including Tom Doyle, current lecturer in Conducting, director of the Senior Orchestra in CIT Cork Sc hool of Music, and one of Alan’s last postgraduate students. Following Alan’s sudden passing in February 2016, Tom took over his conducting classes and the bedrock of the material he uses comes from Alan’s teaching.